40 matches with a 55% win rate. Not bad for me. If I can do it so can you - trust me. Maybe she just draws good teams? I dunno. But I'm sure happy with her... she made life a whole lot easier in getting to R10. I read a lot of what others have said this season and last.. and applied it for myself. Probably read it elsewhere but if you want advice, this is what I did. 1) Played morning and evening hours - avoided the noon to six pm crowds (EST). 2) Avoided - if possible - matches with carriers showing on the queue - meaning when I selected the Battle button and a carrier was showing, I'd hit the ESC key, get out of the MM queue and wait a minute or two before trying again. I will say though you can't always count on that helping you avoid carriers. Many times none were showing in the queue but when the team formed, there were carriers. 3) One rank a day - that was/is my limit. If I was sitting at 2 out of 3 on a rank and lost a match, if it was a really close loss, I'd go again. But I'd never allow myself to lose a rank on one day. If I had only 1 out of 3 stars, no more ranked. Hope that makes sense. 4) I tried to remain calm, focused on the grand scheme of things, where my ship was in relation to the reds. Especially my broadsides since I was driving a BB. Minimap is your absolute best friend. So if me, Mister Joe Doke, an average joe, can do this, so can you. Just set your rules and stick to them. It worked for me, it may work for you. And yes indeed, good team mates make a difference. All the best in your ranked endeavors! Congrats! That’s a small number of matches to get to R10! Thanks - I do believe the timings I chose (morning/evening) made a big difference. How you doing? I got to Rank 10 quickly enough as well, did it within couple days I think of Rank starting this season. So I have been done with Ranked for a while now which feels odd to be done prematurely this season. I started out with the Tirpitz... thought she'd really kick... but man... she (for me) played nothing like she normally would in random battles. I was missing shots which normally would return citadels. It was irritating and a tad depressing. Then I did the Steam deals, got the 'Bama and was like Holy Cow, Batman! Amazing difference. Thanks for the congrats all, appreciated. I do hope some of what worked for me works for others cause honestly, if you get in a bad groove in ranked, it stinks big time. Good Job Reitz, PLUS 1! Wow , deja vu . I started with the Tirpitz for the first three battles , lost two won one and was fortunate enough to get the Alabama as a gift . I've gone from 22 to 17 one rank a day with an 83% win rate in the Bama , the Bama must be a good luck ship . My goal was rank 10 from the start, since there's a distinct lack of anything tier 10 in my port and only 3 tier 9s (Essex, Missouri, and Taiho). It sure saved me from a lot of potential salt. jeez 40 to 10 . think it took me 90. I'm guessing for most of the games you did lose you must of been top scorer . So, meaning no offense, is that good? I don't know, I've never really paid much attention to what other people do. I think I had 3000 games in before I ever saw the summary page. I gave up at rank 12 because I got really tired of looking at the same two maps over and over again. It's something I was giving a whole lot of thought too... not that I want to poke the bear with a stick, but it is weird when such a thing happens. One could argue that RNG could be set per ship if they wanted to argue such a thing. But I can't think of any way to prove such a silly thought. But it's interesting you had a similar experience as me; deja vu indeed. For me, rank 10 was the goal. 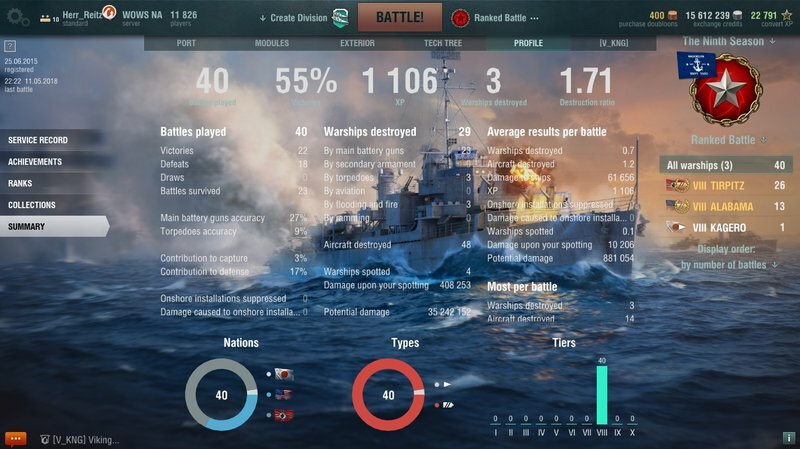 It's achievable and bless their heart, WoWS/WG made it a good "safe harbor" for the tier change as well. Personally, I think it would be nice to see this type of arrangement their standard for upcoming ranked seasons. Somehow, it seemed to work in that general direction. IIRC, when I wasn't I'd be mid-team and we would win. I've been very impressed with most of the players out there this season; "most" of these matches, "most" of the players were dead serious about winning. I could not have done it without their help for sure. Well it's not bad. I'm into and past the entrance to five digit games played. Took me a long while - which is my nature it seems - to really focus down on playing the game in a winning way. I'm still a long ways from my desired play style but making progress. I don't recall what rank I started on but it had to be some of the two star ranks. So figure it's almost win won, lose one but still move forward, cause you win more than you lose. Make sense? I'd recommend you pick it back up and go for R10. You could quite likely get there in fewer games than myself but that's really not the important thing, it was just a personal goal for me. Thing about getting the two maps is you realize where the enemy is, where they will heading (most time) and you can prepare for them. Good luck should you press onward. 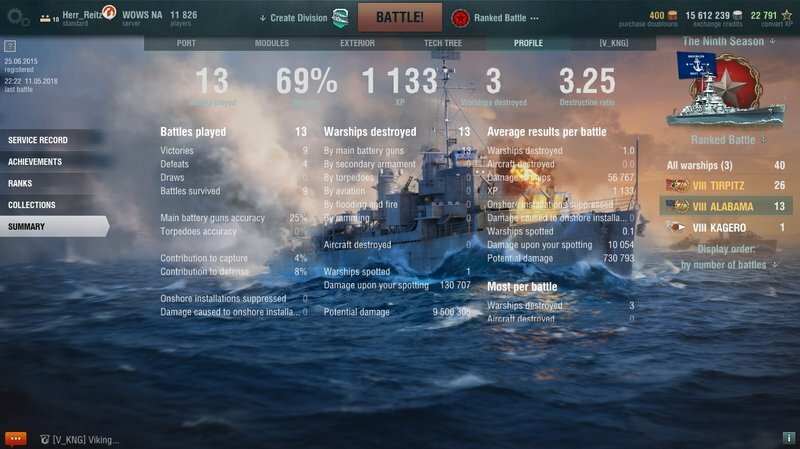 I got to 10 with the Bis that got me to 9th in the previous ranked season but fell flat on my face - 45% WR after 22 battles. Changed to the Prinz and went to 55% WR in 42 battles and rank 10. No tier 10 for trying to get to 9 so I am done for this season but got the flags and 24 hour premium time. I did my grind to Rank 10 in the same amount of games (40), although I took a break off from the entire game for quite a few months while I was sorting some personal issues out and in turn, missed Season 8 - so I started at Rank 23 unlike previous Seasons where they would start you off at a bit higher rank if you participated and got to a certain rank, etc. I had bought the Bama because it was once again on sale and I missed it the first time. At the time, I didn't have many battles in her, so obviously my performance was severely lack luster and I only averaged (not shown in the SS's) 64k of damage in the 3 battles I played her. Then again, the Asashio was on sale as well and with that, I decided to break out my Tier 8 go-to, "The Atago". Despite it not having the damage output of the Charles nor the Kutz, I am not only more comfortable in it, but I have a 19pt, concealment spec Capt. for her. Not to mention can DD hunt with her as well, which is what I felt was most needed in those ranking brackets at the time due to the over abundance of Asashio's and other DD's. 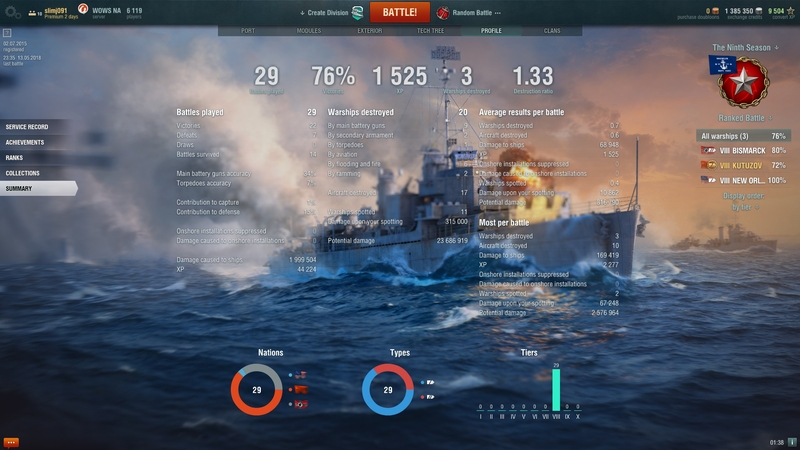 True, I could have relied on my Benson with an 18pt Captain, but with the 2 games in ranked (both wins), after being accused of "yolo'ing" when I wasn't (I was merely taking a cap at the begining of the game, got radar'ed/focused and died quickly due to the opposing team using a lemming tactic, which in all fairness, one can't predict, but in my lack of DD experience I very well could have been out of place in that situation), it was clear that I probably should stick to what I know. Anyway, you are correct good sir. Time and patience is all that is needed, as well as the ability to know when to step away or even call it good for the season if one wants to avoid frustration or even frustrating others as I did. I played 3 Tier 10 games, all of them horrible performances on my part... I stepped back and re-evaluated my game play, comparing my damage output stats (not in ranked, but in randoms), win ratios, ie: all the stats that would matter in a rank setting to those of my Random "Overall" stats. I found that my Tier 10 game play is horrible and that is something I needed to work on, so I stepped out of rank and have been doing just that in randoms. You know what, it's been working too.. My average damage in the Yammy has gone up, not to mention her Win Ratio and I survive longer (she's the first ship I am really focusing on). 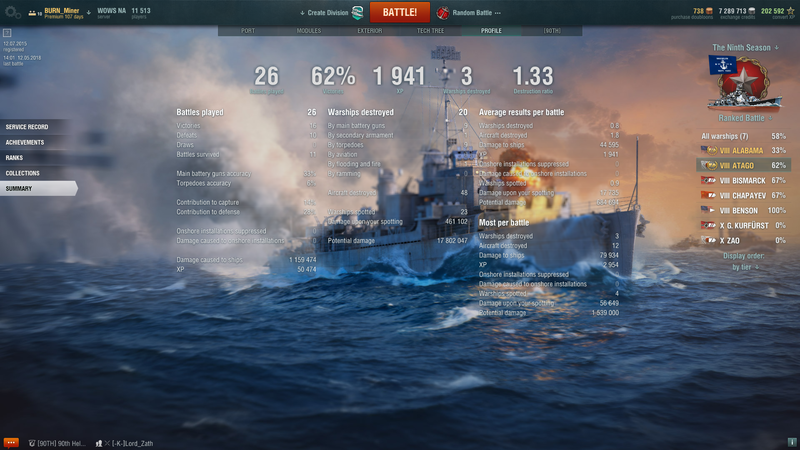 To be fair , I have a 57% WR in the Missouri , which for me is great , I couldn't outfit the NC in time for Ranked though I would expect similar results with her. I play the Mo the Bama and the NC the same way , the Bama feels comfortable , since I knew what to expect out of her guns and armor . I wasn't going in totally ignorant of how to play her . None of this changes the fact that she's an awesome BB though .Being a southerner and having lived in Mobile might have given me some good juju with her too . I only lived in/around Dothan for about what, four to six months? Cripesake been so long i don't remember the actual dates... but was at the Army Aviation area for AIT training in aircraft (helo) maintenance. The kudzo(sp)? growing in the wild was devastatingly thick and that in the early 80's. And the color of the soil was so deep... red I'd call it... stinking hot too... but it was a great place! I enjoyed it! I shared your ambition to hit 10 this season and I managed that today as well. I have to say I tried quite a number of ships and .... 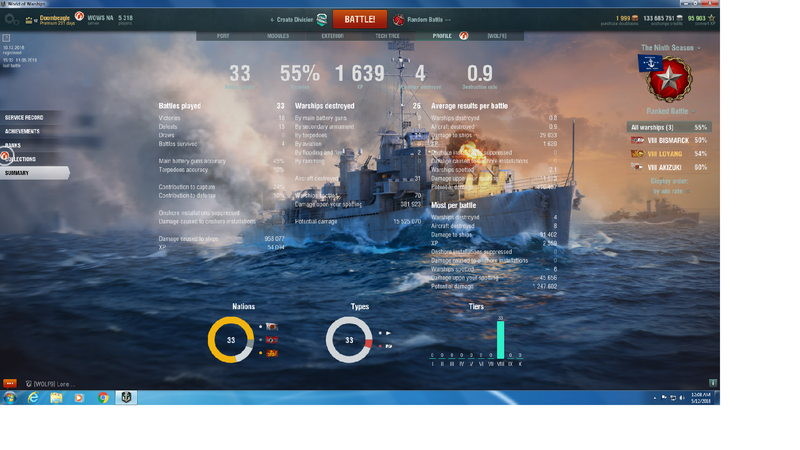 I liked playing DDs and cruisers the best but I found I won more often in BBs. I play fairly aggressively in BBs and it felt, rightly or wrongly, that the degree of passivity in the BBs was the biggest deciding factor in the win/loss up to rank 10. DDs always mostly did their job in trying to cap and cruisers mostly supported them. Having BBs be too passive or wait too long felt like the bioggest drag on the teams so playing BBs I felt my quality of gameplay had a bigger impact. Or maybe I'm kidding myself and all the heavy lifting is done by the DDs only. @Swine_007 most impressive they are... you tried a number of ships, far more adventuresome than I was! Do you think you may go forward from 10 "for the fun of it"? Good DDs do make a difference, I can attest to that... but would you believe a slight pep talk (we got the best ship lineup) seemed to fuel the team to playing good? And I don't have any motivation to go on. So R10 it will stay. 8's." It was eye opening which ships worked well an which did not. In BB's I could in most games win or lose come in first (save a star in a loss) or second. But the DD's and CA's were what made a difference in battle. Who could get and hold the third cap. BB's are too slow to get there fast so the fast CA's that could help the DD the most worked well for me, to actually win the game. After my experiment with all my tier 8's (at level 15 so "safe" rank) I used Chappy to go up to 10. I can't say I love ranked play as too many are just out for damage, and go off alone and die. (I do like Clan battles and the concept to 7x7) And clan battle experience showed in this years ranked play between those that had played the maps and knew where and what to do on various maps! I am now playing most of my tier 10's at rank 10. Just to see again which work and which get smoked. Rank 10 play seems worse than 15 to 11! It's like random with 7 players. I am starting to play ranked. only played 5 match or so, 3 win, 2 top xp on a loss. I am running amagi, which I feel is best BB for t8 matchup. 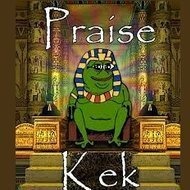 I will get to 11 before it is all said and done. may be 10 if I am motivated, but 11 gives all the flags. All but the good ranked season flag... that's the one you get at 10. If you have the time and feel like it, go for 10 - but don't throw away all the work to get there! Stick with your plan.